Welcome to colourful Istanbul, the world’s only city bridging two continents. On arrival at Ataturk International Airport you will be met and transferred to your hotel. This evening, there is a welcome dinner with the chance to meet other tour members and your guides. After breakfast, journey to Safranbolu. The ancient heart of this museum town is well preserved and features some of the finest surviving traditional Turkish civil architecture. Stroll along the town’s cobbled streets to Cinci Caravanserai and Bath, Kaymakamlar (Governors) House, Izzet Mehmet Pasa Mosque and the old Yemeniciler shoe makers’ guild bazaar. Drive to Ankara, the capital city of Turkey. Visit the Museum of Anatolian Civilisations this afternoon, a brief visit to see Anitkabir, the Mausoleum of Ataturk, father of modern Turkey. Continue your journey to the unique volcanic area of Cappadocia. Optional - Dawn Hot Air Balloon flight over the lunar landscape of Cappadocia. Marvel at the lunar landscapes of Cappadocia on a fully guided tour. 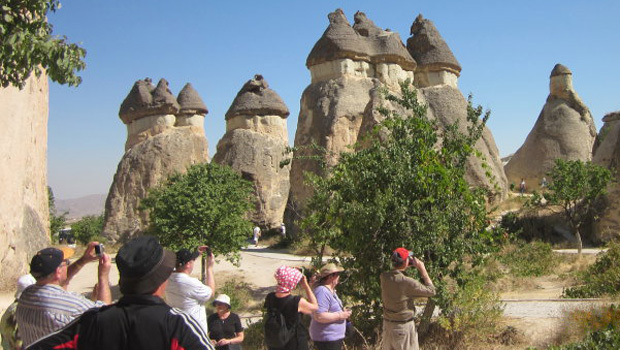 Visit Devrent and Pasabag to see all the stages in the formation of fairy chimneys. In the afternoon, tour the UNESCO World Heritage Goreme Open Air Museum. Discover the art and crafts of rural Turkey in a handcrafts centre at Avanos and attend a presentation about Turkish handmade rugs. Today explore the southern region of Cappadocia and some of rural Turkey. First visit the old Greek town of Mustafapasa. Then visit the confounding engineering and architectural achievement that is the Underground City at Kaymakli, which provided not only shelter but also a safe-haven from invading hordes. 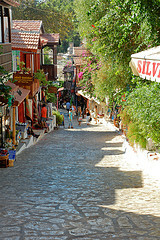 Stop at Ortahisar Town centrally located among Cappadocia towns to enjoy the picturesque scenery. Finish the day with Red valley view point, explore the colourful and breathtaking fairy chimneys. Tonight we enjoy a Cultural Turkish evening show & dinner. Depart early in the morning for the day trip to Antalya. Travelling along the old Silk Road, visit Sultanhan Caravanserai. Stop in Konya for lunch and a visit to Mevlana Museum. 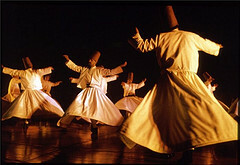 This centre celebrates Rumi, the famous mystic and poet who founded the Sufi Order of the Whirling Dervishes in the 13th century. 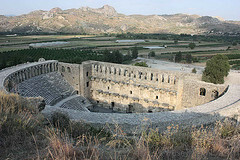 We continue our drive to Antalya, visiting Aspendos, with one of the world's best-preserved Roman Theatres - a highlight today (If there is not enough time left today, we will visit the Aspendos Day 7) and transfer to our hotel. 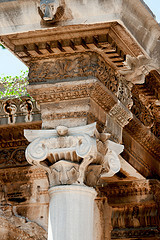 Today, visit the Archaeological Museum that houses one of the Turkey's largest collections. Enjoy a leisurely afternoon exploring this lovely old Mediterranean city. Journey to the ancient city of Myra where there are stunning examples of Lycian rock-cut tombs overlooking a Roman amphitheatre. Stop in at the Church of St Nicholas (better known as Father Christmas) before heading to the tranquil fishing village Kas. 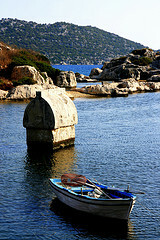 Board a traditional Turkish gulet (yacht) and set sail for Kekova Island. The sunken city of Simena is located here and your day will be filled with mini-stops for swimming, snorkelling and enjoying the balmy Turquoise Coast. Enjoy a tasty lunch on board before returning to Kas this afternoon. Take a leisurely day in Kas. A suggested activity take a ferry to the Greek Island of Kastellorizo, just a couple of kms off the coast. Make a morning departure for the brilliant petrified white lime cascades of Pamukkale. Nearby, at Hierapolis an ancient health spa, you will see the amphitheatre and wander through the intriguing archaeological site. Take a leisurely drive toward the Mediterranean town of Kusadasi via Aphrodisias, the ancient city dedicated to Aphrodite, the goddess of Beauty, Love and Fertility, also famous for its school of sculpture, we visit the stadium, which is the best preserved in Anatolia, the Temple of Aphrodite, the Tetrapylon, theatre, the Museum. Enjoy views of the vegetable gardens along the Meander River Valley. Remainder of afternoon at leisure in Kusadasi. 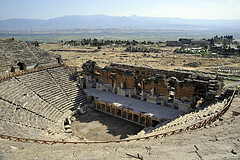 Early morning visit the imposing ruins of Ephesus, one of the most fascinating cities of antiquity in the entire world. See the Temple of Artemis remains (one of the Seven Wonders of the Ancient World) before a visit to House of the Virgin Mary, a Vatican designated place of pilgrimage. Visit the Basilica of St. John, at Selcuk, believed to hold the tomb of the Apostle. After lunch, visit the marvellously intact Greco-Ottoman village of Sirince rounds out your day of touring. Heading north, journey to Pergamum, once capital of the Attalid Dynasty, and visit its magnificent Acropolis. The impressive temples and library made Pergamum a renowned cultural and political centre for its time. 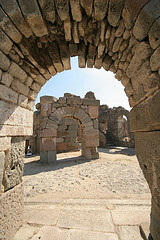 Stop in at legendary Troy before continuing to Canakkale. You will cross the Dardanelles today. Visit the Kabatepe War Museum with its astounding fused bullets, Brighton Beach, Anzac Cove, Lone Pine, Johnston’s Jolly, The Nek, and Chunuk Bair, all within a few kms of each other on the Gallipoli Peninsula. Then after lunch, journey along to Istanbul. 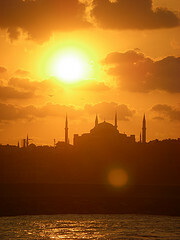 Spend today in UNESCO World Heritage listed Old Istanbul. Visit the Blue Mosque, named for its Iznik tiles, the architectural wonder of Hagia Sophia, Byzantine Hippodrome and lavish Topkapi Palace. Enjoy haggling at the amazing Grand Bazaar where there over 4,000 market stalls. This morning, begin discovering Istanbul at the fragrant Spice Market. Then, board a relaxing Bosphorus cruise. The cruise will return to Eminonu around lunchtime. Free afternoon to explore the old city further, or perhaps enjoy some free shopping time in the bazaars. Farewell Dinner. Your tour concludes after breakfast when it is time to farewell new friends and travel to the airport for your flight home.